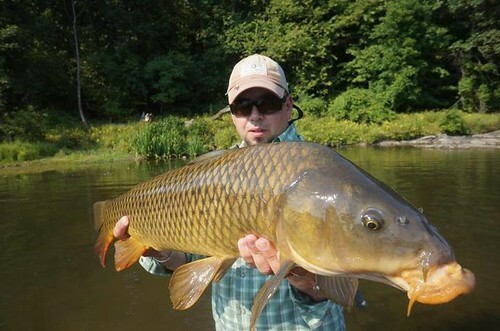 Orvis rod designer Shawn Combs hoists a sweet Neveryoumind River carp last summer. Flying Dogs on a Sunday Morning from Dane Khy on Vimeo. There’s nothing dramatic or funny or exciting in this footage, but it’s a lovely little video of a woman and her dogs playing in the park. The filmmaker says he was just trying to experiment with backlighting, but what he captured here was a lot more than that, don’t you think? Even though the quintessential fly-fishing image involves casting dry flies to rising fish, we spend considerably more time presenting flies underwater to fish we can’t see, and beginning fly fishers learn pretty early in their experience that trout feed on or near the bottom most of the time. This raises an important question: . . . Welcome to another edition of our trivia challenge, where we test your knowledge of all things fly fishing. The scores on last week’s quiz showed a pretty good improvement over the previous week and featured three 100%s (nice job Garth, Neil, and jtrammel72!). Here’s your chance to achieve such lofty heights, with a fresh set of. . . The Ravens and the Forty-Niners kickoff at 6:30 p.m. on Sunday, but some of us will have already seen a couple of great games. Just before the big football game, check out Puppy Bowl IX. Here’s the description from the Animal Planet website: . . .
At this year’s Westminster Kennel Club Showheld at New York’s Madison Square Garden on February 11 and 12two breeds will be added to the competition. The Russell Terrier and Treeing Walker Coonhound are hardly new breeds, but this will be the first time that they are judged at Westminster. Editor’s Note: “First Casts” is a regular feature that highlights great fly-fishing content from around the Web—from how-to articles, to photo essays, to interesting reads. The effects of climate change on Rocky Mountain trout is the subject of an excellent article on the USGS “Science Features” page. There is more and more data available to researchers, which means that the models keep improving. But we’re a long way from a complete understanding of all the interconnected phenomena. Photographer Louis Cahill offer great advice on how to care for. . . This week, in an addition to a long Fly Box section, I go a little off topic as I interview Richard Louv, author of Last Child in the Woods and The Nature Principle, who introduced the term “Nature Deficit Disorder” to the world, and has perhaps done more than anyone else in modern times raise awareness of how important it is to get ourselves and our children outside more often. He’s one of my role models and it was a great honor to interview him for the podcast. And, of course, we do talk about getting kids and grand-kids out fishing and give you some tips on how to do it. In an all-too-familiar scenarion, animal rescuers discovered 26 dogs living in deplorable conditions at a home in Plant City, Florida. Many of the dogs were badly injured and required immediate veterinary attention. It will be a. . .